What's New @ Andrews Green Beans? For Sale: I have refurbished Behmor 1600 roasters for sale for $250.00 Canadian. Sorry, no US sales due to cross border warranty issues, associated duties., & excessive shipping costs. Sold out, sorry! For Sale: I'm also an Authorized Canadian Baratza Repair/Refurb Service Center for Canada. I have refurbished Baratza grinders for sale & all have a 6 month warranty.Sorry, no US sales due to cross border warranty issues, associated duties., & excessive shipping costs. Note: As of Thur Sept 13/07, I have a wholesale commercial account with Ascaso of Spain for aftermarket direct replacement of espresso machine parts.I've started an espresso machine repair & service side (6½ years experience on Rancilio Silvia), Expobar Office EB-61 Leva., to my green coffee business, called Andrews Espresso Machine Repair & Service. As a minimum order from Ascaso's factory is € 300, an order for wholesale priced parts will have to be by a "Group Purchase", for all members of the "Expobar Owners Group" & like I have done for Toronto orders of Intelligentsia Coffee on the Coffeegeek forums. Anyone at all can order parts, you don't have to be a member of any particular group. Prices will be very attractively priced, I guarantee the cheapest in Canada & the USA! Intelligentsia Roasted Coffees Black Cat Espresso Blend™ is exceedingly heavy in body with dominant notes of chocolate, caramel, and dried fruit, this blend is complex and powerful with a lingering sweet finish. & Kid O's Organic Espresso™ a creamy and slightly nutty well grounded espresso with hints of fruit and good complexity, to start! NOTE: As of Tues Jan 13/04, I am proud & honored to be the 1st Canadian distributor of Malabar Gold®, a proprietary Premium European Espresso blend created by Dr. John (Joseph John) & it's in stock too! There are also only four companies to date in the USA carrying Malabar Gold in green form. 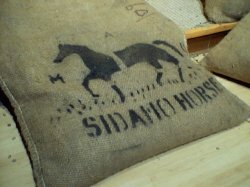 On Mon Feb 9th I just purchased Mexican Monte Azul SHG again, Ethiopian Harrar (D.P. ), Ethiopian Djimmah (D.P.). I'll be picking those three up tomorrow & should be for sale Tues Feb 10th! I received the samples in two lots, one with two in it, & the other with 3 in it (two Ismailis,different arrival dates) on Fri Feb 13th & Mon Feb 16th. Stay tuned! 1 *Bolivia "Colonial Caranavi" BOLICERT/OCIA,SG. Fair Trade. Elevations range from 4,290 - 5,940'. The coffee trees are older cultivars, Typica & Bourbon. The coffee is slightly spicy, full to heavy bodied, mild acidity & has a good balance. 3 *Guatemala "Forestal Tajumulco" BCS/OCIA,S.G, Fair Trade. Elevation's range between 4,000 - 5,000'.Coffee trees are Bourbon, Typica & Caturra. This rare coffee has very good acidity & is nicely balanced with a slight hint of spice. 4 *Mexico "La Manda" OCIA,SG. Fair Trade. 5 *Nicaragua "Matagalpa" SHG BIO LATINA/OCIA, Fair Trade. Elevation's range roughly from 3,960' - 4,620' above sea level in the Matagalpa region. The coffee trees are mostly of the old Bourbon variety with some Caturra and a small amount of Catuai. The coffee's aroma is complex, has a medium body, slight wineyness & a clean finish. 6 *Peru "Penachi" OCIA, SMBC, Fair Trade. This coffee is bright & lively with good acidity, medium body & a pleasantly sweet finish. 7 *Sumatra "Takengon" Gr1 NASAA/OCIA Fair Trade. From the very scenic highland slopes of the Gayo Mountain's near Laut Tawar Lake in the Takengon region of Northern Sumatra, comes this exoticly aromatic "Takengon" Sumatran coffee. This OCIA certified organic Sumatra semi-washed coffee is full bodied, slightly fruity, & clean with a sweet finish. The coffee is great as a single, blender & perfect for espresso. 8 *Uganda "White Nile" OCIA. Elevation's range about 4,500' with plentiful rainfall & rich soils, which is why this area was chosen for Uganda's 1st organic coffee project. This very rare Okoro washed Arabica occurs only in this small region of the world. One of the rarest of coffees, it offers delicate smoky tones with the slightest hints of fruit & spice, with medium body & slight acidity, This is a very limited production! The following additional 8 new Specialty Grade green coffee samples I will have on Mon Oct 6/03 also! 17 *Sumatra "Gayo Mountain" Organic, unwashed, natural D.P. SKAL certified.